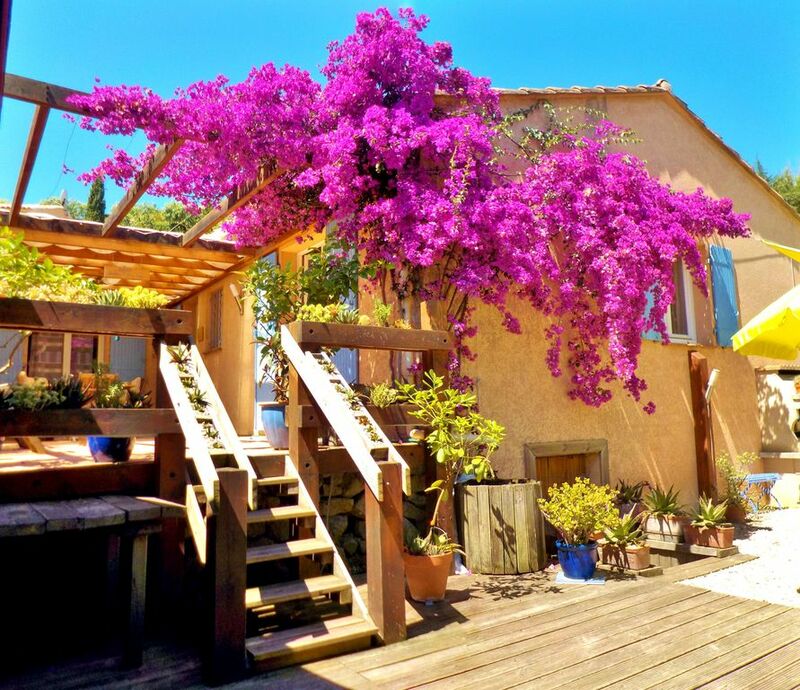 SEA VIEW, VILLA AT THE SAME LEVEL, BEACH ON FOOT, CLOSE TO ANTIBES. The sea is 7 minutes from home, in the car. Visible from the terrace. In addition to the view of the Mediterranean Sea and even Corsica according to the times, on the terrace you will have the Aegean Sea in the garden. You do not believe in it...? Well look in detail at the photos and you will see a small sandy beach with a pond decorated with aquatic plants, fish, and a huge photo of 4.5 m by 1. 70 m which shows the beach Elafonnissi in Crete and the mountain ..... And you can have lunch on the beach with the barbecue next door under a shade sail. How good are you at home? When I see the round eyes and the gaping mouth of young people, especially on arrival, I know that our villa is pleasing. There, it is difficult for parents to hold them back. . In the evening, a table and chairs or armchairs will receive you for the aperitif. 'L'Esplanade du Bonheur à Plein Temps', our terrace inevitably attracts them, the loving ones. The honey color of the larch of the covered pergola will make the eyes shine. You will have all your meals on the eucalyptus table. The ceiling fan will bring a sweet Zephyr on hot days. In the evening, the amber light, supplemented by a lighting on the ground will offer a POETIC ROOM. 300 days of annual sunshine. A hanging garden with a small collection of cacti will complete the very vegetal decor. Want sun? The terrace is discovered and decorated with two loungers in eucalyptus. Let you ... hurry. Convinced? Upon request a hammock will be provided. In spring, there are two hundred thousand flowers available to us: the hedge of pyracanthas, cherry, plum, russelias, succulents like aloes vera, all very well maintained and clean. A word about the garden: if you read the German in the comments on abritel, read the one about it. I extract Der Garten, eine Pracht, in other words the garden, a marvel. In the house, you notice our love for photography and Greece. I hope this will allow you to travel a little more. The basin of the bathroom is a kind of agate, bought in Greece. The Côte d'Azur is full of attractions. This is not limited in any way to the coastal strip. We will help you to prepare your visits in the nearby towns and villages, the hinterland, even the department of the Var relatively close. The activities are particularly numerous. For museum enthusiasts, there is an important choice: museums of glass, pottery, history, bonsai, Fernand Léger, Picasso. In Nice 14 museums ... and many others. The choice can not be exhaustive. We will be happy to inform you. Enjoy a day to visit ST Tropez by boat rather than by car. Possibility by helicopter. Monaco is a must, Villefranche sur mer, Mougins with its artists and many restaurants. Tell us the style of holiday you want: sports, relaxation, ecological. Some of these villages or towns are familiar to you, others not even at all. We will comment on them. Our own slide shows are available on You Tube by typing Jean Marie Wenzler and then 116 videos. There are many museums in Nice in particular. But the first of them are less than 1 km away: Fernand Léger and Bonzaïs. In Biot, always on foot, the museum of blown glass or art. After spiritual foods, let's come to earthly foods. We love a restaurant in Antibes. His name is Vauban. A menu at 39 euros of beauty in a charming setting, no frills, but a love of the unusual profession. The disappointment does not exist in this place. Count 100 euros for two with a half bottle of wine and coffee. It should book because the place is very popular. The menu is to read on the internet. In Valbonne a restaurant that was recommended by the restaurant Vauban will also satisfy you. This is the sommelier's bistro. Excellent address. Alain LLorca, Le Blanc-manger and especially the workshop of flavors are at Colle sur Loup and hold their ranks brilliantly. We have a special affection in another area: hiking. We seek to share them. Papers will be given to you for this purpose. Small or large hikes, make your choice. Everything is allowed. The nearest ski resort does not exceed one hour's drive. A geological curiosity can be the subject of a trip by car. The gorge of Cians towards Auron are exceptional. Imagine the red rock, the Pelite but for 25 kilometers. Note that you can see just on our personal beach garden. It's magic. The Gorges du Verdon, our local Colorado is accessible during a day. The bathroom has been completely renovated in February 2013: walk-in shower. Very large library (1500 titles about), from simple comics, Victor Hugo, through Alexandre Dumas, Sir Arthur Conan Doyle, Slaughter, Danielle Steel, Cousteau, or various authors, several magazines such National Geographic, Science and Life, GEO. Disco. The 80cm TV (LED) is new as well as home theater. Rate at month (4 weeks) is possible on the basis of weekly rate X 3 is a 25% reduction Outside the summer period, all proposals will be heard. Great short break & villa in good location. A short break of 5 nights and the owner just could not have done anything more to make the visit a great success. Lots of contact prior to arrival to ensure everything was in place for accessing the property and even a welcome drink in the fridge to get comfortable on arrival. The villa is well situated in a quite corner of a small estate and easy by car to reach the beaches and shops, including a dog friendly beach only 10 minutes away. The villa had everything we required and the gardens were extremely well cared for and the strawberries were just great! Tanks for a great stay. Maison très agréable, rien ne manque. Elle est bien située près de tout. Joli jardin. Cette maison est vraiment très agréable à vivre, bien aménagée, et rien ne manque. Elle est entourée d'un joli jardin bien entretenu. Elle est très bien située, près de la mer, des commerces, des restaurants, et sa situation centrale permet d'effectuer de nombreuses visites sans avoir à faire beaucoup de kilomètres. Notre séjour s'est superbement déroulé et c'est sans hésiter que nous recommandons cette location. Tres jolie maison au calme près de la mer . trés jolie choses a visiter. C'est effectivement une maison familiale de charme très confortable avec un très beau jardin et deux belles terrasses très agréables, le tout conforme aux photos. L’environnement est parfait pour passer des vacances au calme et sécurisé car la résidence est fermée. Possibilité de garer sa voiture dans la cour fermée. Location très agréable pour un tarif très raisonnable. Nous sommes venues avec notre maman de 87 ans et Mr et Mme Wenzler ont eu une délicate attention en nous offrant des jours supplémentaires afin que notre maman se repose davantage avant de faire le voyage retour. (Nous venons de la Marne). Merci aussi d’avoir accepté nos trois petits chiens. Nous recommandons vivement cette location qui est bien placée pour les visites de la Côte d’Azur …Très beaux villages : Gourdon et Mougins ….. (entres autres) car la région est belle. Séjour du 9 au 21 septembre 2017. Trois semaines passées entre le 05 et le 26 août 2017 dans cette maison fonctionnelle et bien située. On s'approprie rapidement les lieux. Très bon rapport qualité prix. Propriétaires très accueillants, bienveillants, sympathiques et disponibles tout à fait dignes de confiance. Nos deux petits chiens ont apprécié le jardin agréable et ombragé. A recommander sans hésitation. Seit mehreren Jahren verbringen wir, Mutter (45), Vater (45), Tochter (16) und Hund, unsren Urlaub in Südfrankreich. Das Haus ist wie beschrieben sehr liebevoll ausgestattet und trägt die persönliche Note der Eigentümer. Der Garten mit Terrasse war ein Ort der Erholung, perfekt zum Ausspannen und Grillen, alles vorhanden und ein eigener Parkplatz im Hof. Das Haus befindet sich in einer abgeschlossenen Wohnanlage, dennoch sind es nur ca. 5-10 Min. mit dem Auto zum Einkaufen (großer Supermarkt) und dem Strand. Generell ist die Lage für Ausflüge ins Hinterland bzw. nach Nizza, Cannes usw. perfekt, unsere Lieblingsstadt war Antibes. Der Hausherr ist super nett, steht jederzeit bereit einem zu helfen wenn man es möchte, ansonsten genießt man einen unbeschwerten Urlaub. De bien belles vacances reposantes en famille. Depuis plusieurs années, nous passons nos vacances dans le sud de la France, avec notre chien. (45 ans pour mon mari et moi-même, et notre fille de 16 ans). La maison est amoureusement équipée et conforme aux photos, et porte vraiment la marque du propriétaire. Le jardin et la terrasse sont propices au repos, avec un parking intérieur. Le tout est sécurisé. La maison se trouve dans un lotissement, et il ne faut que 5 ou 10 minutes pour les courses dans les hypermarchés et plages. La position géographique centrale est idéale pour les sorties vers l'arrière pays, Nice, Cannes. Notre ville préférée reste Antibes. Le maître de maison est super-gentil, très disponible pour aider en cas de besoin. Golf The first course is located 1.5 km but there Valbonne, Nice, Mandelieue Napoule, Grasse. Golf Schools nearby. Skiing: The first winter sports resort Gréolières is 60 km away. Isola 2000 and Auron 110km.